The formation of priests is a response to the call of Jesus Christ. After He spoke to Peter and Andrew, the two laid down their fishing nets and followed him (Matt. 4:18-20). 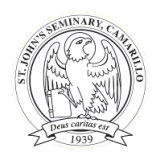 St. John’s Seminary helps to form men to serve the Church as priests. Candidates seeking admission to St. John’s Seminary require the approbation and sponsorship of their respective diocesan bishops or religious superiors. Applicants for the Archdiocese of Los Angeles must apply in person or by letter to the Archdiocesan Vocation Director. Candidates who belong to a religious community, or who wish to be enrolled for another diocese, will be admitted only on the written recommendation of their respective Ordinaries or their duly appointed Vocation Directors. All candidates, without exception, must conform to the standards of moral and academic fitness required by this seminary, in accordance with the prescriptions of Canon law, and must give evidence of being able to conform to the goals of the seminary. The seminary always reserves the right to dismiss a seminarian when it considers him unsuitable for seminary life or priesthood. For a detailed description of the requirements for admission please refer to the current academic catalog. Applicants are interviewed by the Admissions Committee and tested by means of academic examinations and other examinations in accordance with The Program of Priestly Formation (PPF #47) of the National Conference of Catholic Bishops. The seminary also reserves the right to refuse admission to applicants when it judges them to be unsuitable for seminary life or for the priesthood. Anyone applying for admission who has not already done so to the satisfaction of the Admissions Committee, will undergo full psychological evaluation at his own expense. This also applies to those who are seeking readmittance. Applicants for whom English is a second language may be asked to take an examination in English and, if necessary, to do remedial language study. An applicant may be required to begin remedial work before beginning his studies at the seminary or as soon as possible after beginning his studies at the seminary. An applicant may be denied admission if there are sufficient indications of inadequate language skills or academic preparation.